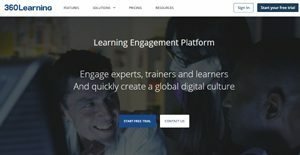 360Learning is a learning engagement and training platform that provides learners and trainers with a commonplace to create a learning culture. It allows users to setup digital learning culture in less time and enables them to create online courses in just a few clicks. The platform uses social interaction, gamification and mobile friendly features to get learners engaged and involved in online courses. For trainers, it works more like a marketing and management platform and offers course optimizations, A/B testing and real-time tracking. The platform is being used by some key industry players that all aim to create a global digital learning culture within the organization. It allows trainers and experts to achieve more in less time and helps them become digital experts without having to go through lengthy technology lessons. The platform is compatible with all web and media formats and allows organizations to reuse their existing resources. This allows businesses to leverage their existing best online content and helps them discover innovative formats that make it easier to produce new interactive content. The platform allows creating different kinds of evaluations, including open-ended and closed-ended questions. Trainers can also develop brainstorming sessions, business goals, collaborative activities, exams and more. Trainers and experts can be reviewed by the community, while the platform highlights such reviews to encourage participation. The platform uses a gamified ranking system, which makes it easier to identify top performers for each skill. Advanced tools promote continuous improvement by generating actionable suggestions for course improvement. 360Learning involves learners in online courses on a day-to-day basis and helps increase engagement rates using gamification methods, which are inspired by popular web practices. Groups can be created based on different variables such as by class, by arrival date or by theme, while detailed analysis on these groups or communities can also be performed. The platform puts human interaction at the center of the training strategy by allowing effectively collaborating and innovating during the courses. All the features the platform offers has to offer are mobile friendly, which allows learners to access important stuff right from their mobile devices, and from anywhere. Companies have unique wants and requirements and no software solution can be just right in such a situation. It is useless to try to find a perfect off-the-shelf software system that meets all your business needs. The wise thing to do would be to adapt the application for your special requirements, staff member skill levels, finances, and other factors. For these reasons, do not rush and subscribe to well-publicized popular solutions. Though these may be widely used, they may not be the best fit for your specific requirements. Do your research, investigate each short-listed application in detail, read a few 360Learning reviews, speak to the maker for explanations, and finally select the app that presents what you need. How Much Does 360Learning Cost? We realize that when you make a decision to buy Learning Management System - LMS it’s important not only to see how experts evaluate it in their reviews, but also to find out if the real people and companies that buy it are actually satisfied with the product. That’s why we’ve created our behavior-based Customer Satisfaction Algorithm™ that gathers customer reviews, comments and 360Learning reviews across a wide range of social media sites. The data is then presented in an easy to digest form showing how many people had positive and negative experience with 360Learning. With that information at hand you should be equipped to make an informed buying decision that you won’t regret. What are 360Learning pricing details? What integrations are available for 360Learning? If you need more information about 360Learning or you simply have a question let us know what you need and we’ll forward your request directly to the vendor.